Today I journeyed to Springfield, Massachusetts through the Springfield Daily Republican (dated September 2, 1913) where I found an article on the “Genius of Thomas A. Edison”. 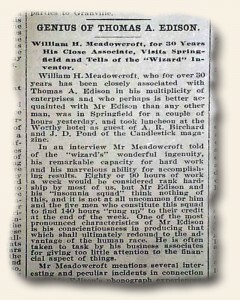 William H Meadowcroft, who was closely associated with Edison, was interviewed and spoke of Edison’s capacity of long hours of hard work. Even though Edison was significantly hard of hearing, he could detect unusual other sounds and he used this ability to perfect recording techniques. There also appears to have been a pricing war between the newspapers in San Francisco. “…The field is now sharply divided, with all four afternoon newspapers selling for one cent each, and the two morning papers adhering to the old price of five cents.” I guess the headline of the article says it all, “Cheaper to Read at Night”.